The Papago Freeway is the section of the Interstate Highway 10 that runs through central Phoenix. This last section of the highway, started in 1983, was not completed until 1990, making it the most-delayed and most-expensive portion of the I-10! 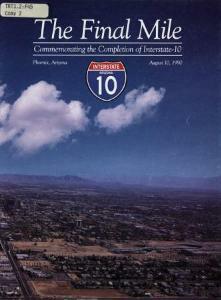 Where does the I-10 run through Phoenix? When was the Phoenix section begun? When was it completed? What were the challenges faced by the builders of the 1-10 Papago Freeway? Who created the documents linked above? What did they think of the Papago Freeway? Is there a bias in their writing? If you were in charge of building the Papago Freeway, would you have done it differently? Why or why not? Visit the websites below to learn more. Based on this new information, have your answers to the questions above changed?